Wiltshire, UK – Business owners from a wide range of cutting-edge Swindon and Wiltshire companies gathered yesterday at The Workshed to share the vision for the brand-new business incubation hub, based in Brunel’s former Carriage Works in Swindon. 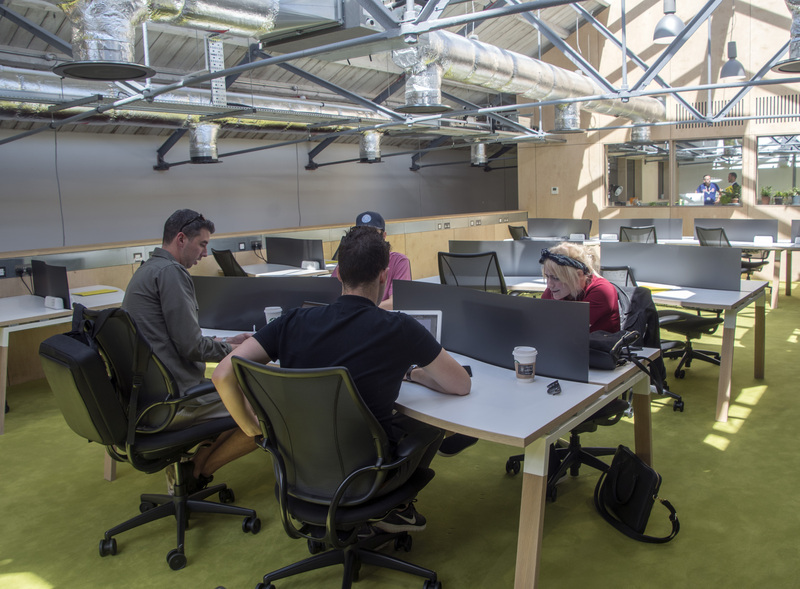 The place was buzzing as visitors from start-ups and established firms rubbed shoulders and took advantage of the half-day free co-working pass to try out the super-fast broadband and other facilities. There was a cutting-edge demonstration of geospatial augmented reality tools by Tim Hughes, CEO of The Carto Group, which is one of the first occupants of The Workshed. 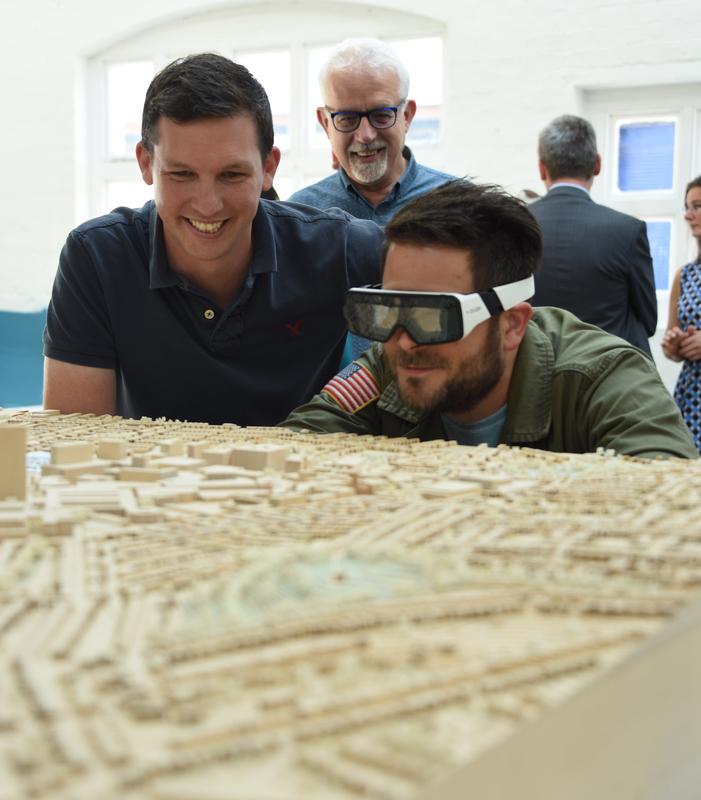 He wowed visitors with software which brought to life a basic wooden architectural model of the 7-acre Carriage Works site, with futuristic holograms and 3D imagery in glorious technicolour! Tim Hughes used to work for Halcrow’s worldwide headquarters in Wroughton. He was involved in urban planning in the Middle East for several years and specialises in the construction industry and The Carto Group has an impressive client roster. Tim explains “I’ve been following this development’s progress for two years and I’ve completely bought into The Workshed vision. Swindon needs this Tech hub very badly if we’re to stake our claim as being part of the UK’s ‘Silicon Valley’!” Tim is collaborating with high-profile companies to bring people to The Workshed and get them involved. The Workshed’s eclectic mix of old and new marries 21st Century facilities with Swindon’s engineering and manufacturing heritage. For example, 200-year-old wooden floorboards have been recycled into 20-foot high sliding doors, which contrast with geometric pinewood ply staircases leading up to an airy mezzanine space. Rough stone walls, aluminium ducting and expansive skylights add to the industrial heritage atmosphere, while a large communal kitchen/lounge area has colourful furnishings. Shower facilities are also available. See www.theworkshed.co.uk A far cry from many bland office interiors that pepper town centres these days, most of the offices were snapped up even before the centre opened on 1st June. Only one remains unoccupied. However, from August, another batch of offices will be available for rent. If you are interested in renting or co-working space (packages start at £75 for 30 hours pcm), or joining the roster of event speakers, contact info@theworkshed.co.uk or call 01793 230322. The Enterprise Network (TEN) and Wiltshire Council are responsible for day-to-day operations, while Swindon Borough Council owns and funded the £2M site redevelopment. A special introductory offer is available on the £75/30 hours a month co-working rolling contract package; “Buy one get another month free”. Terms and conditions apply. Swindon is an ideal location for businesses as it sits on the M4/M5 corridor and the mainline railway between London and Bristol. It is within a 2-hour drive of over 25 Million people. Swindon has a population of circa 220,000 and is home to a number of national company headquarters such as Intel, Nationwide Building Society, HONDA and several of the 7 Government Research Councils such as Water, Medical, The UK Space Agency, and Innovate UKwhich relocated out of London. Productivity amongst Swindon’s workforce is among the highest in the country. See www.switchontoswindon.com for full details of what the town is doing to encourage inward investment, and the opportunities for a fulfilling lifestyle in and around the town. This press release was distributed by ResponseSource Press Release Wire on behalf of The PR Catalyst in the following categories: Business & Finance, Manufacturing, Engineering & Energy, Construction & Property, for more information visit https://pressreleasewire.responsesource.com/about.